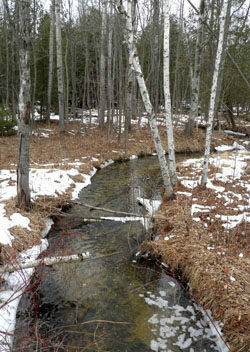 Lying adjacent to US-31, one of the busiest roads in Charlevoix County, yet relatively obscured is Susan Creek Nature Preserve, the perfect escape. 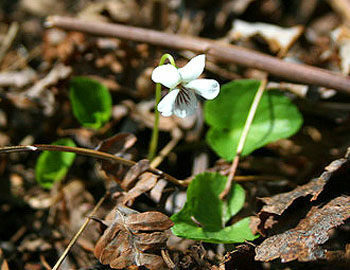 The 223-acre preserve consists of three separate tracts and features a 1.5-mile loop that winds through hardwood forests, meadows, black ash swamp and cedar thickets, making it an outstanding area to sight wildlife. The trail also include a pair foot bridges that span across scenic Susan Creek. The Little Traverse Conservancy preserve provides trail access to the adjacent 55-acre Taimi Hoag Nature Preserve owned by Little Traverse Bay Bands of Odawa Indians. Together the two tracts contain 278 acres, 0.75 miles of Susan Creek and more than 1.5 miles of US-31 frontage. It was Little Traverse Conservancy’s desire to protect the scenic corridor of US-31 between Petoskey and Charlevoix that lead to acquiring the area. 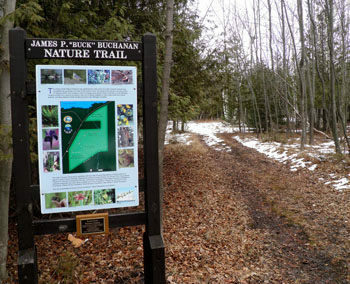 In 2007 the trail system was completed thanks to funding provided in part by the Buchanan Family and today is known as the James P. Buck Buchanan Nature Trail. On maps the Susan Creek path is also referred to as the Blue Trail and listed as 1.3 miles. The Taimi Hoag path is labeled as the Red Trail, is listed as 0.8 miles and is currently being developed as an interpretive path with numbered posts already installed. When combined the two trails make for a 2.7-mile outing, the one described below, that requires backtracking only a half-mile segment of the Red Trail. The most popular use of the area is for hiking but mountain biking is also allowed in Susan Creek Nature Preserve and the trail system is easy to reach from the Little Traverse Wheelway which located only a few hundred yards northwest of the entrance and parking area on US-31. Mountain biking is not allowed in Taimi Hoag. In the winter the preserves are an excellent destination for an easy cross-country ski or snowshoe outing as much of the trail system is either old two-tracks or former railroad grade. The trails are not groomed. From the parking area and trailhead along US-31, the Blue Trail departs east as a old two-track and within a 150 yards reaches the junction with the Red Trail. All junctions are posted with maps and blue or red arrows, making the trail easy to follow. The second junction of the Blue Trail is reached at Mile 0.25 where a narrow foot path heads right and leave the two-track and immediately enters an open meadow. You return to the hardwood forest and at Mile 0.6 arrives at the old railroad bed. Head left to follow the grade and in a couple hundred yards it crosses Susan Creek on a foot bridge. The Blue Trail departs the railroad bed at a well marked junction at Mile 0.8 and at Mile 1 arrives at a long stretch of planking that will keep your boots dry in the spring. Halfway along the boardwalk there is an impressive foot bridge across a scenic stretch of Susan Creek. More planking follows and at Mile 1.3 you arrive at the first of two junctions located 100 feet within each other. The second allows you to continue with the Red Trail by heading north (right) or quickly return to the trailhead by heading south (left). The Red Trail adds another 1.3 miles to this outing and loops along a high bank above Susan Creek before heading back. Along the way you pass a series of 10 numbered posts with post No. 10 overlooking the creek, a scenic spot to take a break. From the creek you return to the trailhead by following the length of the Red Trail. At the end it skirts a pond and surrounding marsh, the result of gravel being excavated from an a post-glacial beach ridge in the 1950s for construction of U.S. 31. Other than a parking area, there are no other facilities at the Susan Creek Natural Preserve trailhead. There are no vehicle or entry fees to hike or ski at Susan Creek Nature Preserve. 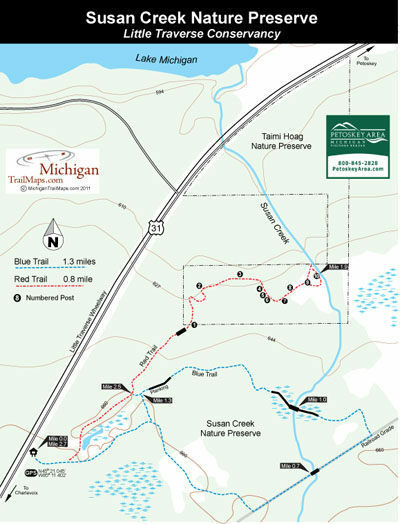 The trailhead and parking area for Susan Creek is well posted on the south side of US-31, 4 miles east of Charlevoix and 11 miles west of Petoskey or a few hundred yards southeast of the entrance to the Big Rock Restoration Site, the site of a former nuclear plant.